One thing that sometimes is fun to do in a dollhouse is decorate a "kid's room" with popular kid themes... this can be difficult because of copyright laws. 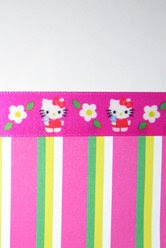 You can create your own, but not distribute them... that being said, I won't post any like that here, but here's one simple thing you can do... right now Wal-Mart (likely other craft stores too) has a cute Hello Kitty ribbon that is the perfect scale for a doll house. 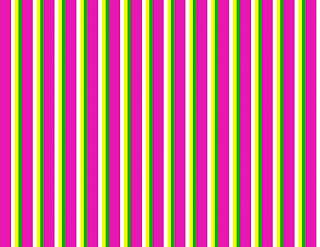 So I designed a coordinating striped wallpaper... you could paper the entire wall and put the border at the top, or paper just 1/3 or 2/3 of the wall, paint the rest, and "join" the two with the ribbon border. Here is a picture of the ribbon so you know which one I'm talking about (the flash distorted the color a bit), as well as the free wallpaper download. what is more adorable than Hello Kitty dollhouse wall decor. Very cute!